Jaromir Jagr says the NHL needs to look at why the Florida Panthers were penalized twice in the third period of Thursday's win over New Jersey after fans threw toy rats onto the ice during the game. Giving away 10,000 toy rats to fans as they arrived at the arena was supposed to be a promotion for the Florida Panthers. "I don't really agree with the penalties," Jagr said after Florida moved back into first place and on the brink of clinching just the franchise's second playoff spot in the last 15 seasons. "We can always say, `Hey, it was New Jersey fans throwing them, we should have the power play.' It's too important a game and it's going to be more important in the playoffs. I don't think we should get 2 minutes for that. I think the league should do something about it." Actually, the league did something about it — two decades ago. "It was a bonus for us to get those power plays on that," Devils coach John Hynes said. "Unfortunately, we couldn't find a way to make them pay a bigger price for it. ... I think it's tough for the players, for sure. There was a warning prior to it and it kept going. Tough situation. I think the fans were trying to have fun and do their thing, but if we capitalized on a couple of those power plays it's a little bit of a different game." 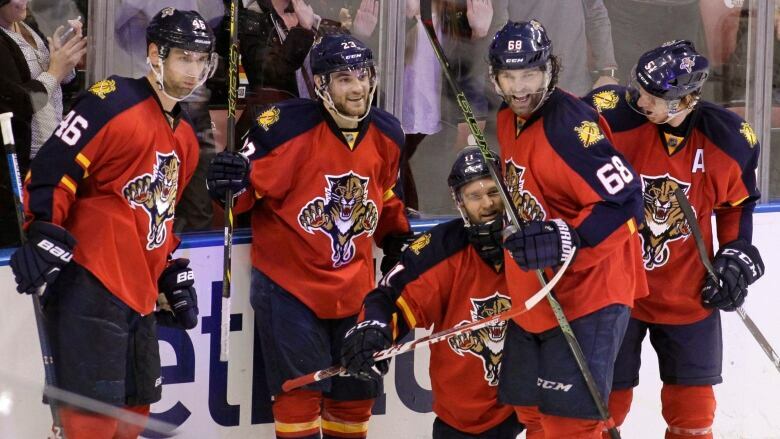 "They called it like they were supposed to call it," a visibly annoyed Panthers coach Gerard Gallant said. "There's nothing they can do. When we throw stuff on the ice, it's the rule, it's been the rule for a long time, they've got to know better. I sure hope it doesn't happen again. ... We've got to be smarter than that." "That's not my department," Gallant said. "But like I said, I hope the fans understand that these are important games and points for us. I hope they understand that you can't throw these rats until the end of the game. It almost cost us tonight. Our guys battled hard and we love our fans and we love the rats, but I hope that doesn't happen again." "If they're going to give us a penalty every time somebody throws a rat, then where are we going to play in the playoffs?" Jagr said. "They're just going to hire some guy to throw rats and get power plays all game. It doesn't make sense to me."